Prototype: Class 01.5 steam express locomotive with a coal tender. GDR German State Railroad (DR/GDR) "Reko" version. 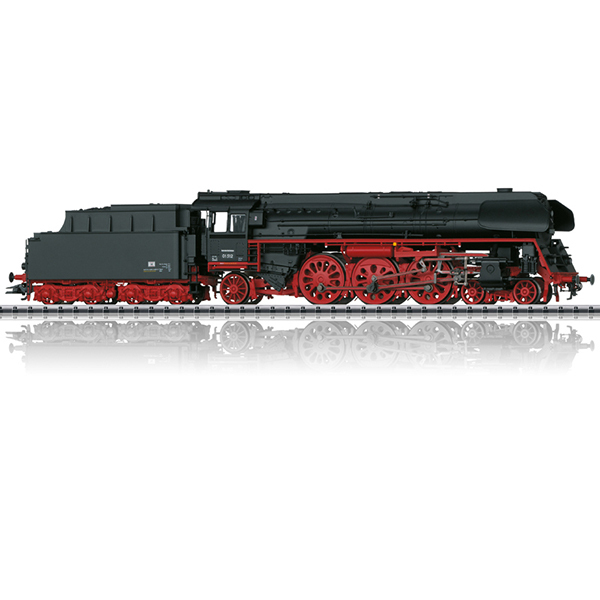 Includes Boxpok wheels, type 2´2´T34 standard design coal tender, special design Witte smoke deflectors for the class 01.5, continuous dome streamlining, inductive magnet on one side, and buffer plate warning stripes. Road number 01 512. The locomotive looks as it did around 1967. Highlights: Completely new tooling. Especially finely detailed metal construction. Striking Boxpok wheels and continuous dome streamlining. Partially open bar frame and many separately applied details. Digital decoder and extensive operational and sound functions included. This model can be found in an AC version in the Marklin HO assortment under item number 39205.